This resource is amazing for anyone who teaches Power & Conflict from AQA Anthologies! This 16 page document is a great way for students to learn the meaning of the quotes and keep them for their knowledge and revision. 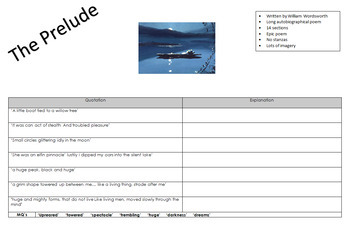 Each page includes the poem title, picture, small information box with poem information (writer, themes, structures etc.) 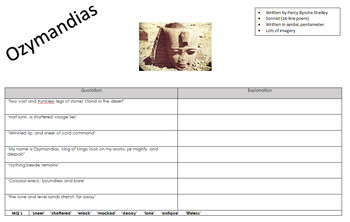 and quote table of all the quotes in that poem with a blank ‘meaning’ column for students to fill in. There are also two pages at the end for additional quotes and additional information. Poems included are: Ozymandias, London, The Prelude, My Last Duchess, The Charge of the Light Brigade, Exposure, Storm on the Island, Bayonet Charge, Remains, Poppies, War Photographer, Tissue, The Emigree, Checking Out Me History and Kamikaze. I also have quotation banks for An Inspector Calls, Macbeth and Jekyll & Hyde which can be bought separately or discounted in a bundle of all 4.